Made it to Kadara Port, a wretched hive of scum and villainy to discover more about an Angaran Resistance soldier that seemingly betrayed the Angaran people by abducting the Moshae. Prior to arriving there, I made a stop off at the Nexus to unlock another one of Alec Ryder's memories - one where it was the last time he had a family reunion – and actually the first time you get to see your sister Sara Ryder walking around conscious (albeit in a flashback). Not sure if I did an entirely good job with her at character customisation but oh well, too late to change it now (or is it? Patch 1.08 might have to something to say about that). Making realistic looking characters in MEA is actually more difficult than you might think. Peebee's definitely opened up to me more, talking about her past and revealing that she's developed a new robotic ally using Remnant technology. She also invited me to have a "no strings attached" fling in zero G but I declined. I also witnessed Gil and Kallo arguing about how best to treat the ship, i.e. by keeping it to the original spec as Kallo prefers or to have it tinkered and modified as Gil prefers. To be honest, I was hoping there'd be a way for both of them to resolve their differences, or see the fact that both viewpoints can be valid, depending on the context. However, it was not to be and I had to choose who was right. Considering Gil's view was more flexible than Kallo's and since I guess I have a natural affinity towards engineers, I sided with Gil. Kallo was not too impressed (as you can imagine). While on Kadara, I helped the Resistance break out the abductor of the Moshae (so he could trade an Outcast cell for a Resistance one). He revealed he abducted the Moshae because he thought the Resistance was foolish to protect her no matter the cost; since the Kett were willing to end the war if the Angarans gave her to them (or at least he was led to believe), he thought it was a good deal. But he now realises he made a mistake. He still doesn’t like Evfra, leader of the Resistance though. Also picked up MOAR side quests on Kadara, such as investigating murders and helping a doctor get a formula for the Andromedan equivalent of penicillin (although it has been re-purposed by the Outcast leader, Sloane Kelly, as an addictive drug called "Oblivion"). Also helping to find a woman that was wrongfully exiled into the Badlands for not paying her protection fees to the Outcasts. Now I need to find her. Oh, while exploring the slums near the Badlands, I came across Conrad Verner's sister Cassandra (Conrad Verner was an annoying guy that idolised Commander Shepard in the original ME trilogy)! Despite Cassandra saying she's different to her "crazy family" she's in reality just as bad as Conrad as she idolises Sloane Kelly. 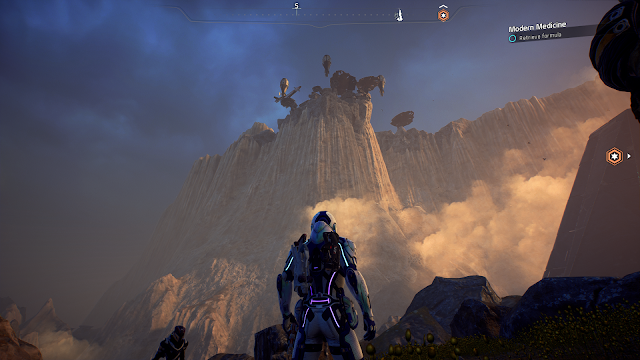 While exploring the Badlands on Kadara I found another link to the Milky Way in the form of a couple of ex-Cerberus agents; they apparently got disillusioned with Project Lazarus (the very same project that brought Commander Shepard back to life in Mass Effect 2) and started conducting mind control experiments in the Badlands. I was given a choice of leaving them to their experiment, transferring the mind control onto the scientists (and potentially harming the test subjects) or making their existence less painful. I took the latter option but not sure if it turned out for the best since it really depends if you’d rather take the blue pill or the red pill. Also managed to get the formula for producing medicine from a native plant that is currently used as the recreational drug I mentioned before called "Oblivion". At least that's what I think it is as I came across an Asari scientist that claims the so-called doctor I was working for was a fraud and doesn’t actually want to help the common folk. I ended up not trusting the Asari on the off-chance the other guy was actually genuine but we'll see what happens. Also turns out Drack and Vetra get along pretty well. Still loving the Nomad talks. A highlight of the game I reckon. I intended to play more MEA this weekend but didn't because the game was patched to version 1.08 which means I can customise my character at anytime during the game (yay?) and I can pursue a gay relationship with Jaal (yeah..... nah. Not happening with my Ryder). Ohnoes! I've already failed in ensuring I play a minimum of one hour per game listed as part of Pile of Shame Sunday! That’s right – I didn’t play any Company of Heroes 2 this week. ☹ Oh well, there’s always next week and I’ll try to put in a couple of hours this time. I seem to be completing levels through sheer luck nowadays and the puzzles are getting ridiculously difficult (at least for me). They’re taking longer and longer to complete and the last puzzle I did took a whopping 45 minutes! There was a lot of retrying on that level and lots of expletives uttered! I managed to finish Stage 5 and am now on the final stage, Stage 6 where you’re just pretty much wrecking the entire City of Tomorrow, not just the gadgets. I’ve also been playing a lot of the versus mode with my daughter (since it’s her favourite game at the moment) – although despite her finding it fun, I don’t think it’s particularly good: it’s basically a mixture of Bomberman (which is one of my favourite oldschool games) and some weird version of Capture the Flag where you highlight shapes to capture territory. Capturing the territory locks it so nobody can steal it, until another player uses a bomb to kill your Tom – this then unlocks all your territory for the taking. And that’s all there is to it.